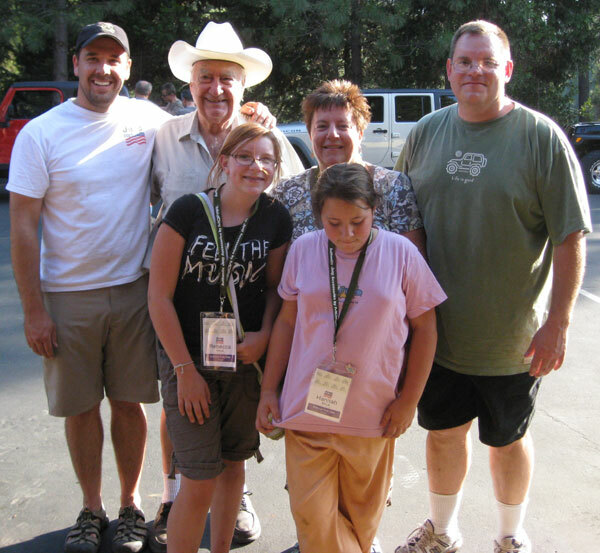 Norman, Rebecca, Hannah and I just came back from our very first Jeep Jamboree USA Event. 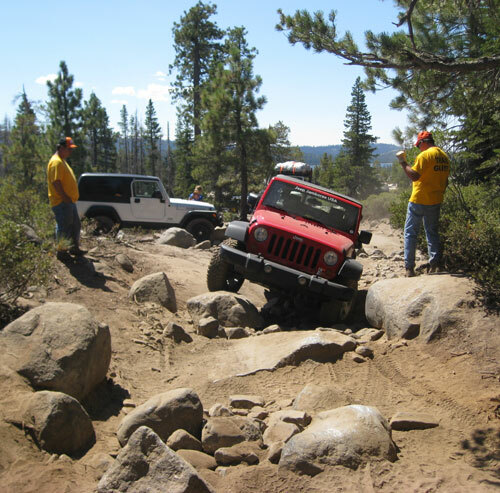 It was the Aug 15-17 Jeep Jamboree on the Rubicon Trail. 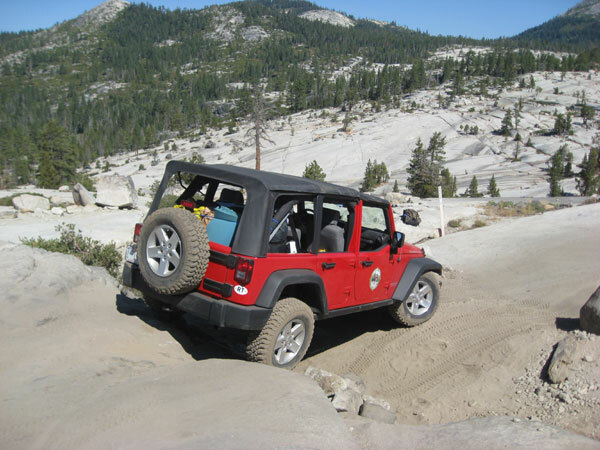 We left from the Jeep Jamboree USA headquarters in Georgetown, CA on Friday morning at about 6:30 and finished up the trail down by Lake Tahoe on Sunday afternoon around 2pm. Saturday was spend in base camp in Rubicon Springs doing absolutely nothing (well, actually lots of things, but nothing that was required!) No cell phone, no computer service, no laundry to do, no orders to pack, no vacuuming, no mowing the lawn, no website to monitor. It was fantastic! I read a lot of Jeep forums and talk to a lot of off-roaders and one of the biggest debates I see is whether or not it's worth the money to participate in a Jeep Jamboree. Honestly, we've been wheeling for almost 20 years and we don't need "help" figuring out what line to take and how to get around an obstacle. And, we'd always rather ride with a small group than a large group. So we've never felt the desire to sign-up for a Jeep Jamboree. We did this Jamboree because we are a sponsor of the event and we were going to be in the area that week visiting family in Reno. Wanted to see what it was really all about. YES. It is worth it. And if the other Jamborees are run like this one - you will get your money's worth too. Here what I think. First - you need to know how much the Rubicon Trip costs. Okay, here are the tangibles that you get for your money. It's always good to have a spotter for the tough areas. It stinks when they aren't good at it. I would guess there were about 20 Trail Guides set up at different parts of the trail, and traveling with you in their own Jeeps, all ready to help get you over the obstacles safely and with the least amount of damage to your Jeep. Depending upon your skill level, they guided you accurately, or spotted you when you took your choice of path. (Hi Bob & Charlie and everyone else in the orange hats!) They did a great job and come to find out, they don't get paid to do it, they volunteer their time. 3. Mechanics on and off the trail to fix any problem you had. Less than a half hour into the ride on Friday we broke a valve stem. 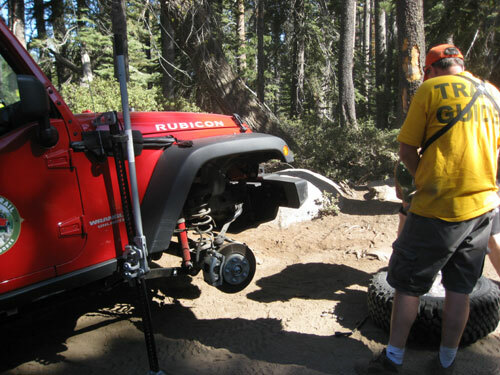 With the help of a few trail guides, we changed the tire in about 3 minutes and were back on the trail. Back at camp, they came over to the Jeep and replaced the broken valve stem. No charge. One guy tipped his Scrambler and did some decent damage. (hope everything is running right again Richard!). The mechanics on the trail fixed the problems right there on the trail and had him up and running again. He was the last to roll into camp on Friday evening, coming in at about 9:30 but he was fixed and smiling! My guess is that he had about $300-500 worth of replacement parts installed, along with about $500-$800 of labor done on his Jeep, all as part of the price he paid for the weekend. 4. 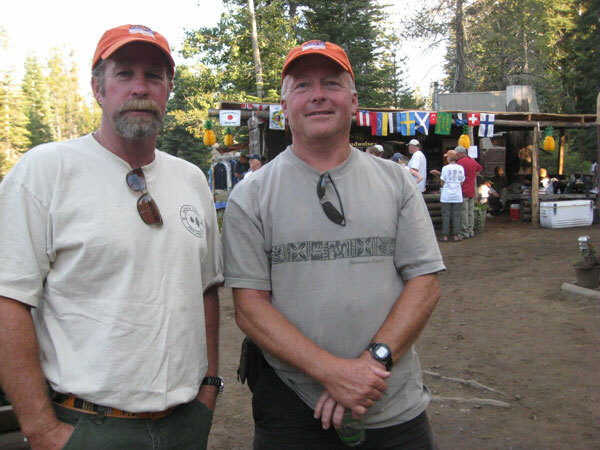 Expert teachers at camp who gave talks on the history of the area and the geology of the area on Saturday. Learned about the Indians, the rock formations, the mineral springs, etc. These were the tangible items that you pay for. 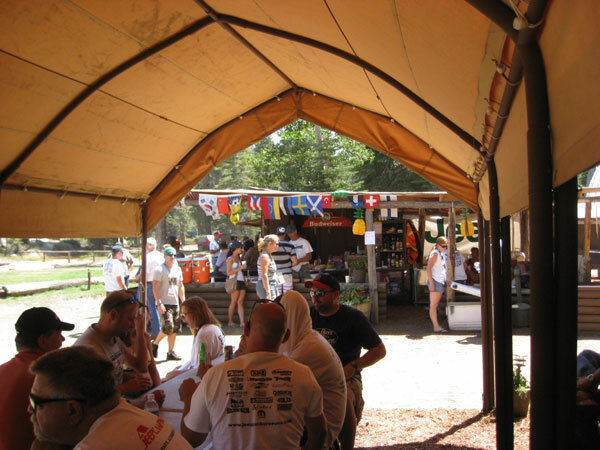 The intangible items are the comraderie you feel meeting up with old and new friends (all new for us, but some attendees told us this was their 8th or 9th Jamboree). Everyone is doing what you are doing and you can spend hours talking about Jeeps, off-roading, obstacles on the trail, mods made to their Jeep, etc. If you like this stuff, you'll be in heaven. 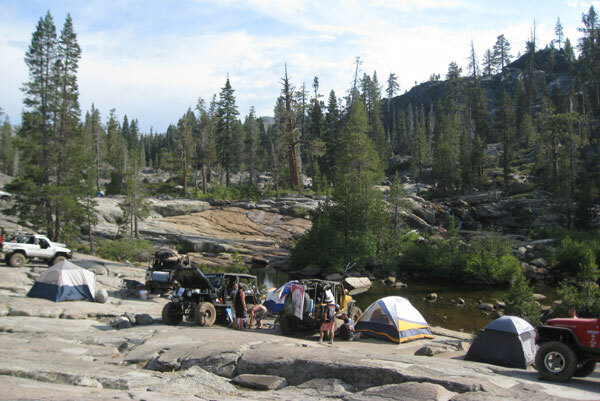 Rubicon Springs, which is where base camp is, can be summed up as this - outdoor lovers paradise. 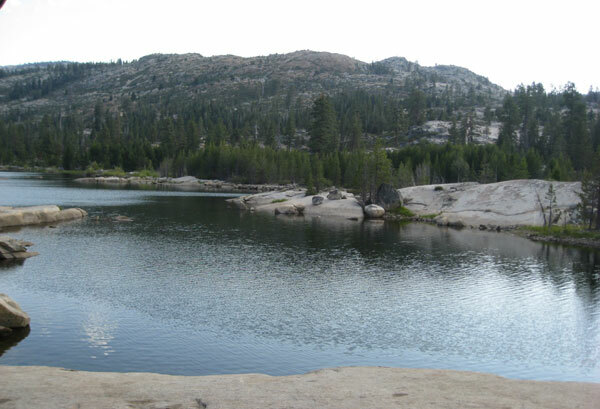 You can walk up the trail a bit to the section of the river which is dammed up and take a swim in a mountain lake. Or sunbath on the giant slabs of granite that surround the lake. You can kick back with a beer and listen to the piano player who played at the gazebo during all meal times. At night, after dinner, the bonfire burned for several hours and many enjoyed hanging out, listening to guitars, talking more about the day, and watching the stars. Personally, I enjoyed the lack of the cell phone and computer! 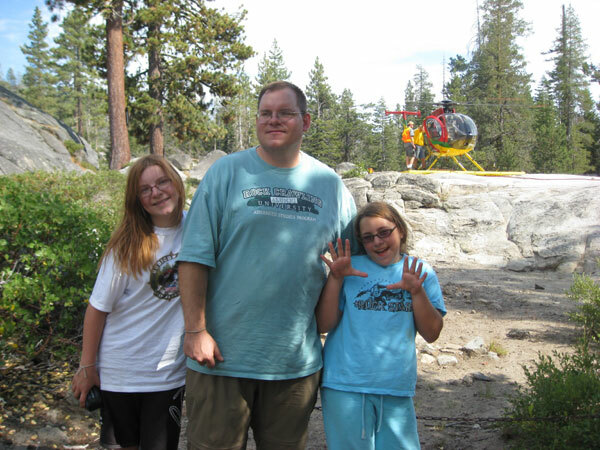 A highlight for my daughters was the chance to take a helicopter ride on Saturday where they got to see the whole trail they had come over and were about to complete on Sunday. Here is Rebecca, Norman (owner of All Things Jeep) and Hannah. For me, I got to meet Mark Smith, the founder of Jeep Jamboree USA and his wife, along with the other great folks from the organization (Hi Glenda and Pearse). Everyone was so welcoming and went out of their way to make sure everyone had a great time. And we did! View More Photos of the RUBICON TRAIL JEEP JAMBOREE USA 2008 from Jean and Norman (us). Use this link to check out our entire All Things Jeep Photo Album that includes lots-o-jeep-photos.